Its the first of the month, which means its time for some monthly goals. Here are this month's goals! Work on my relationship with God- This is one of those things where I feel like if you put a lot of effort into your relationship with God, that everything else will fall into place. I kinda of fell off the wagon with reading my bible and spending time with God. So I want to get back to that place where I was before. Work on future goals- Since spring semester (for school) is coming to an end in a few weeks, I need to work on fall semester classes. I need to figure out what I want to take and what my school goals will be for the new ''school year''. Manage my time better- This goes along with my relationship with God goal. I've been so busy with school and other things that I feel like I could manage my time better. So this month I'm going to move things around and see what time I save here and spend there. 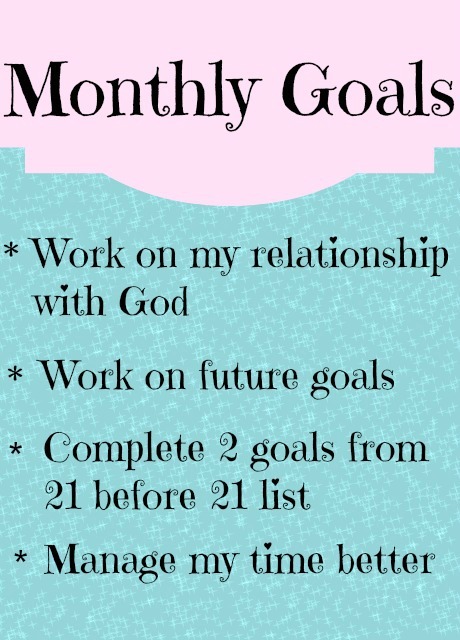 Those are my goals for the month! What are your goals for the new month?